Peter Noone is a multi-talented entertainer, who has been delighting audiences nearly all his life. At the age of fifteen, Peter achieved international fame as “Herman”, lead singer of the legendary pop band Herman’s Hermits with hits like I’m Into Something Good, Mrs. Brown, You’ve Got A Lovely Daughter, I’m Henry VIII, I Am, and Can’t You Hear My Heartbeat. Noone went beyond the world of music by taking on acting with the same zeal and success. 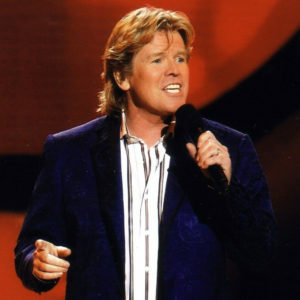 Accompanied by his band, Herman’s Hermits, Noone performs over 200 concerts a year to sold-out venues. Today’s teen girls scream just as passionately as their mothers did back in 1965, prompting VH1 to select Noone as their viewer’s choice for the “Sexiest Artist of the Year.” There is no doubt that Peter Noone’s extraordinary talent, disarming wit, handsome features and compelling stage presence will continue to delight fans of all ages, for a long, long time to come. The Latshaw Pops Orchestra will open for Peter Noone with a celebration of the ’60s.